A Knight at the Opera examines the remarkable and unknown role that the medieval legend (and Wagner opera) Tannhäuser played in Jewish cultural life in the nineteenth and early twentieth centuries. The book analyzes how three of the greatest Jewish thinkers of that era, Heinrich Heine, Theodor Herzl, and I. L. Peretz, used this central myth of Germany to strengthen Jewish culture and to attack anti-Semitism. In the original medieval myth, a Christian knight lives in sin with the seductive pagan goddess Venus in the Venusberg. He escapes her clutches and makes his way to Rome to seek absolution from the Pope. The Pope does not pardon Tannhäuser and he returns to the Venusberg. During the course of A Knight at the Opera, readers will see how Tannhäuser evolves from a medieval knight, to Heine’s German scoundrel in early modern Europe, to Wagner’s idealized German male, and finally to Peretz’s pious Jewish scholar in the Land of Israel. Venus herself also undergoes major changes from a pagan goddess, to a lusty housewife, to an overbearing Jewish mother. 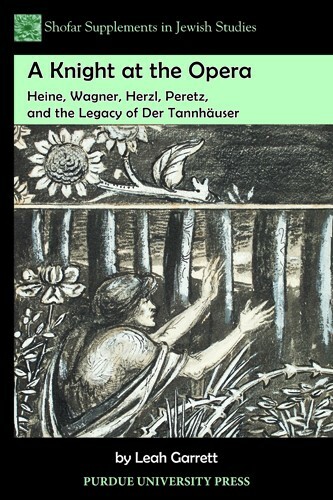 The book also discusses how the founder of Zionism, Theodor Herzl, was so inspired by Wagner’s opera that he wrote The Jewish State while attending performances of it, and he even had the Second Zionist Congress open to the music of Tannhäuser’s overture. A Knight at the Opera uses Tannhäuser as a way to examine the changing relationship between Jews and the broader world during the advent of the modern era, and to question if any art, even that of a prominent anti-Semite, should be considered taboo. Leah Garrett is the Loti Smorgon Research Professor of Contemporary Jewish Life and Culture at Monash University, having previously been an Associate Professor of English and Judaic Studies at the University of Denver. She received a PhD in Jewish Literary Studies from the Jewish Theological Seminary. She has published two previous books: Journeys beyond the Pale: Yiddish Travel Writing in the Modern World (Madison: University of Wisconsin Press, 2003) and (as editor) The Cross and Other Jewish Stories by Lamed Shapiro (New Haven: Yale University Press, 2007).